To add to the scenic views along the Monaro Hwy just north of Bunyan is a new army of green tree guards nurturing yet another native plant revegetation plot. 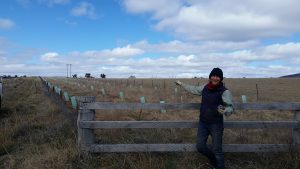 The new plot, installed by Sue and Steven Wallace, of more than 200 native trees and shrubs runs along the Monaro Hwy between the Bunyan Gravel Pit and the Bunyan Glider Club. It links into an adjacent healthy stand of white chested Ribbon Gums (Eucalyptus viminalis) and Snow Gums (E. pauciflora). This particular tree association is listed by the NSW Government as an Ecological Endangered Community that tends to hug the tops of the slopes and ridges right through the otherwise barren Monaro plains. Unfortunately, the Ribbon Gums have succumbed to a massive tree dieback episode. Indeed, over 5,000sq km of the Monaro is now covered with dead Ribbon Gums. It seems there is no single smoking gun to explain why they have died or why some remain healthy like the cluster behind and beside the Bunyan gravel pit. In response to this tree dieback event (which spans over 5,000 sq kms), Upper Snowy Landcare and Greening Australia have been installing their own biodiversity and provenance trial plots which can also be seen dotted along the highway amongst the dieback affected trees south of Cooma. Sue and Steve Wallace, with the help of the Green Army, have been planting stretches of their property with great success despite the slow growing conditions on the Monaro. The ground was deep ripped, the native mix of seedlings were sown deep into the rip line (up to halfway up the stem) with a fertiliser tablet and then protected behind a good quality and well staked tree guard. Then the wow factor, a techline with drippers was rolled out along each rip line and keyed back into nodes that are programmed to turn on and off on a weekly schedule. “Now, if that, and a hit of carbon emissions from the passing traffic doesn’t help these trees to establish then not much will,” Sue quipped.